There is always a scramble to find supplies when it's time to play charades. For each team, you need some paper (to make the challenges), a pen (of course), and a bag to let the other team's players draw their charade challenge from. I decided to make a nice charades kit. Added bonus: it will be a gift for my friend who loves to play charades, and often suggests it when there's a large group around on a holiday weekend. She also plays charades sometimes on New Year's Eve, so I wanted the bags to be a little bit fancy, but still whimsical. This is an easy sewing project. I up-cycled some materials, and you could certainly recycle some fabric. Instructions here, here and here. - Decorative ribbon or braid - also up-cycled from various packages, wrappings, etc. - Two small notebooks and two pens to go inside the finished bags. I happen to like Rhodia notebooks, and they can be obtained inexpensively at art supplies stores. but any notebook would do. Once you decide how big your bags will be, you need to cut four rectangles of equal size. My rectangles were 11" tall x 9.5 inches wide. Next measure 1" from the top on the 9.5" dimension. 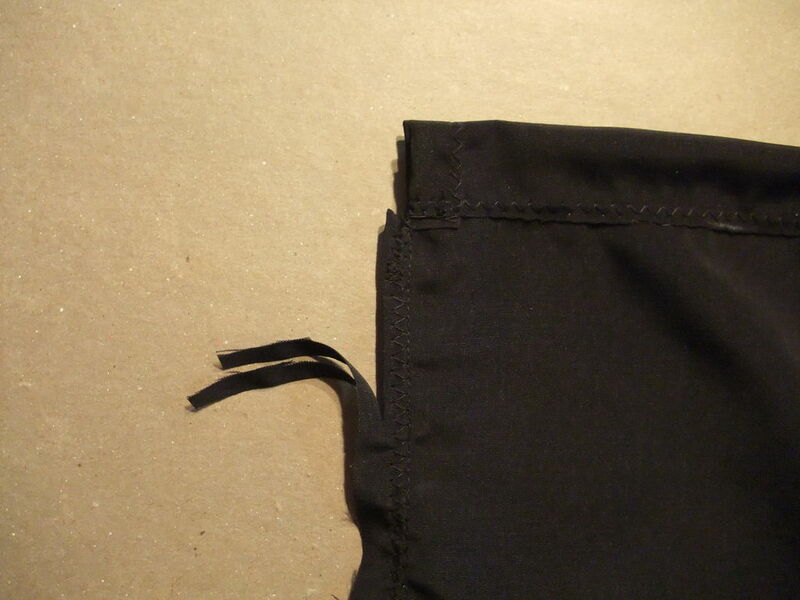 This is going to be the top of your bag, and the drawstring cords will go through here. Experienced sewers will recognize that you could do this faster with less finishing. However, I wanted this to look really nice when done, so have finished all the edges. My fabric looked the same on both sides. But if you have a "good" side and a "wrong" side, in this photo, the good side is down. Fold over 1/2 inch from the top of the bag, and pin it. Use a zig-zag stitch if you have one, close to the edge. Now fold over the top 1" that will become the channel to hold the drawstrings. Pin this in place on all four pieces, and sew it down. I used a zig-zag stitch close to the edge. If you are working with a fabric that frays easily, you might wish to make this one inch foldover bigger, to allow you to turn under the ragged edge. Adding the decorations to the good side now is much easier than waiting until you have sewn the bags together. You could use many different types of decorations (or none at all). I wanted to make geometric shapes with some red ribbon and gold trim. Tip - if you want the trim to line up at the seams, mark the point the trim goes. Pin the right sides together for each of the your two bags. carefully match at the top where the drawstring will go. Now sew the two pieces together, stitching 1/2 inch from the edge. I suggest going around again with a zig-zag just outside the straight stitching. Then trim off the excess fabric in the seam allowance. If your friends are like ours, charades can be a very lively affair, especially with all the kids helping. You want the bags to be strong. If you have a large safety pin around, this will make it much easier to thread the cords through. If not, sometimes a paper-clip will work. Thread two cords through one side. Then take one cord and go through the other channel in one direction. And the other cord goes through in the other direction. Put a good knot in each drawstring cord. At the end, you will have two loops of cord. One loop will have a big knot on one side, and the other loop will have a knot on the other side. Two fun looking charades bags, each containing a note-pad and a pen.